21 APRIL 2016 | GENEVA During World Immunization Week 2016, held 24-30 April, WHO highlights recent gains in immunization coverage, and outlines further steps countries can take to “Close the Immunization Gap” and meet global vaccination targets by 2020. Eligible candidates are invited to apply for admission in DM, MCh, MD/MS, MDHA, MDS, MSc (Basic Sciences and Nursing), MPH and Fellowship in Emergency Medicine Programs for 2016 session. Details of eligibility, seats available*, fee structure, admission procedure and other information are mentioned in the prospectus. Please visit our webpage: entrance.bpkihs.edu to download prospectus and to apply online. 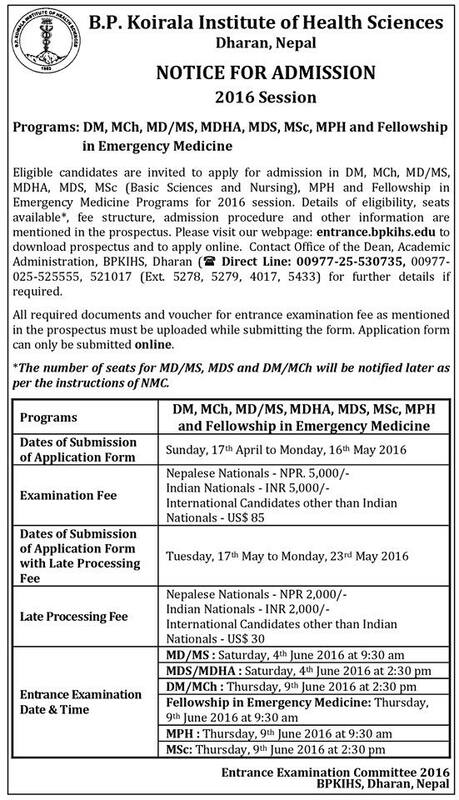 Contact Office of the Dean, Academic Administration, BPKIHS, Dharan ( Direct Line: 00977-25-530735, 00977-025-525555, 521017 (Ext. 5278, 5279, 4017, 5433) for further details if required. HAPPY NEW YEAR 2073 !!!! Pokhara 7th April 2016 District Public Health Office- Kaski organised World Health Day celebrations activities in coordination with Nepal Diabetes Society, United Reference Laboratory, Diabetes and Thyroid Treatment Center, Adarsha Samaj National Daily and Radio Safalta at Pokhara. Mass rally was organized to spread awareness about prevention, treatment and diabetic care to all general people. Distribution of pamphlets, posters and brochures to public was also conducted during rally. Nursing students from different Nursing college, public health professionals, stakeholders and general peoples were participated. after closing session of rally free blood sugar test campaign was also organized by United Reference Laboratory, Newroad. Every year, the World Health Organization selects a priority area of global public health concern as the theme for World Health Day, which falls on 7 April, the birthday of the Organization. The theme for World Health Day 2016 will be diabetes, a noncommunicable disease (NCD) directly impacting millions of people of globally, mostly in low- and middle-income countries. Diabetes is a chronic, metabolic disease characterized by elevated levels of blood glucose which may over time lead to serious damage to the heart, blood vessels, eyes, kidneys, and nerves. The prevalence of diabetes has been steadily increasing in the past few decades, in particular in low- and middle-income countries. Knowledge exists to reverse this trend through targeted prevention and appropriate care.